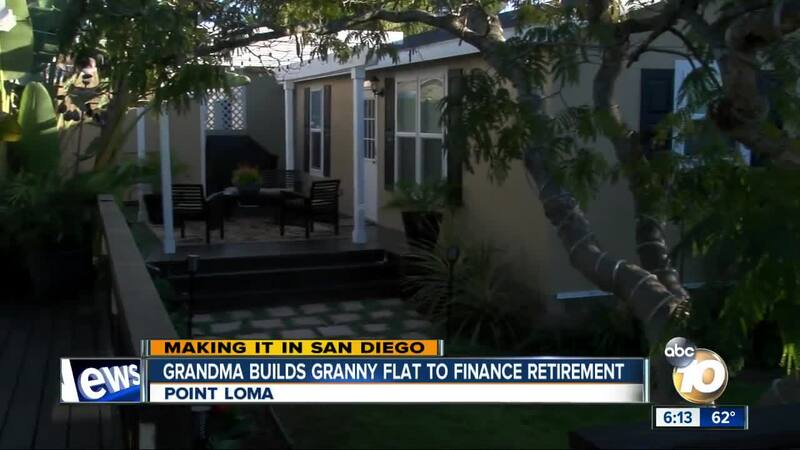 SAN DIEGO (KGTV) - A grandmother of four had a granny flat constructed in her Point Loma backyard to help finance her retirement. Dianne Rodriguez will be retiring in the next few years after decades of working in the hospitality industry. This year, she decided to build a retirement plan. She spent $90,000, construction and permits included, for a pre-built granny flat. Work started in April. The landscaping and final touches were recently completed on a 375-square-foot, one bedroom, one bath tiny home, which she plans to rent out as vacation rental on Airbnb. "Living on a fixed income won't be easy. This will supplement our income and enable us to stay in San Diego, and do some traveling," said Rodriguez. She opened it up to her first tenant this week. The cost of the granny flat will add about $300 dollars to her monthly mortgage. She hopes to take in about $3,000 a month from renting it out, which translates into an extra $2,700. The company that built her tiny home is Instant Guest Homes. Owner Michael Avery says interest in tiny homes has surged since the City of San Diego relaxed its granny flat fees in May. He says the fees for an average project have shrunk by about $12,000. "Our clients are split between people who are using them to keep the family close, for example, moving grandma into an Instant Guest Room, and people using it for extra income for their retirement," said Avery. Click here for more information.